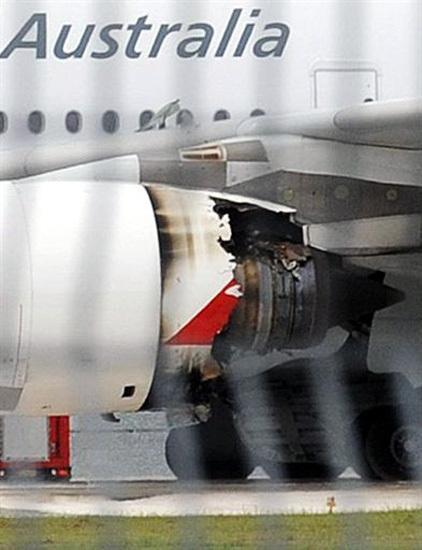 Airbus superjumbo A380 Qantas-owned airline made an emergency landing in Singapore. The aircraft emergency landing because one of the machines in its left wing on fire. A number of aircraft debris also fell in the area of Batam. One engine on the left wing of the plane on fire. AFP / Roslan Rahman. We landed a number of fire trucks on standby. They spray the liquid directly into the multilevel plane. AFP / Roslan Rahman. 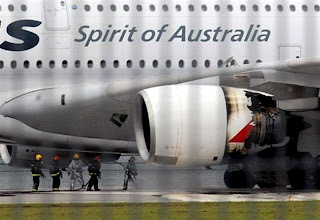 The plane aims Sydney, Australia was carrying 433 passengers and 26 crew. No injuries in the incident. AFP / Roslan Rahman. Firefighters spray water into the burning aircraft engines. Reuters / Vivek Prakash.